This recipe is from a woman named Emmie Oddie, who's a well-known home economist in Canada She had a column in a farming newspaper, and would test her reader's recipes in her own kitchen. Then she would write about the recipe. These are so tasty sweets and are so rich that you only need a small piece. But I love the idea of no baking and they make great holiday treats! 1. 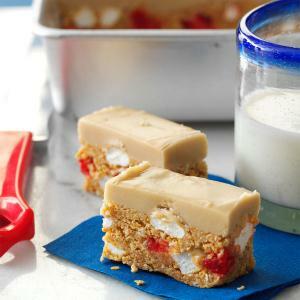 In a large bowl, mix cracker crumbs, marshmallows, coconut and cherries; stir in condensed milk and flavoring. Press into a greased 8-in. square baking pan. 2. For frosting, in a small saucepan, combine brown sugar, butter and milk. Bring to a boil, stirring constantly; cook and stir 3 minutes. Transfer to a small bowl; cool until lukewarm, about 15 minutes. Stir in confectioners' sugar until smooth. Spread over crumb mixture; refrigerate until set, about 1-1/2 hours. 3. Cut into bars. Store in an airtight container in the refrigerator. Yield: 32 bars. Editor's Note: Look for unsweetened coconut in the baking or health food section. mm yummy, this with a big pot of tea. Thanks for sharing this recipe.